Daniel Shaver, 26, is dead. Mesa, Ariz., Police Officer Philip “Mitch” Brailsford, 27, a cowboy armed with an AR-15—with the words “You’re fucked” etched on the dust cover—executed him in a hotel hallway as he sobbed and begged for his life. The video of the 2016 shooting was not released until after Brailsford was acquitted Thursday of second-degree murder charges. In the wake of this horrific act of state violence, there has been some outrage. Black activists, as usual, have sounded the alarm, while the #AllLivesMatter trolls have remained predictably silent. This is not unusual in the aftermath of a white person being killed by cops. We witnessed this two years ago after police officers in Louisiana killed 6-year-old Jeremy Mardis. This time, though, there have also been passive-aggressive and intellectually dishonest statements that pass judgment on the Movement for Black Lives for not taking to the streets and protesting on Shaver’s behalf. Writing for The Atlantic, Conor Friedersdorf stops just short of blaming black people for a perceived lack of mainstream media coverage surrounding Shaver’s death. The author links to Campaign Zero, founded by Brittany Packnett, Samuel Sinyangwe, DeRay Mckesson and Johnetta Elzie (who is no longer associated with Campaign Zero), as evidence of “the movement’s” “race-neutral policy reforms.” He does this even though Campaign Zero does not represent the Movement for Black Lives; even though the campaign is not associated with the Black Lives Matter Global Network in any capacity; and even though the campaign has platforms that tackle white supremacist policies, such as broken-windows policing. Friedersdorf focuses on the benefits of so-called race neutrality, and not the movement’s explicit focus on the most marginalized, targeted and oppressed communities in this country, for reasons that soon become clear. Later in the piece, he mentions the “debate” surrounding the veracity of claims that black people are disproportionately killed by police. He does this by sourcing an article from the National Review, known for being a racist publication, which claims that more black people are killed by police because more black people commit crimes. Let’s make this plain: Black people are disproportionately killed by police officers in this country because they are black. That is not speculation. That is not up for debate. That is fact. It is fact that statistical analysis has shown that crime rates do not influence the rate by which police officers kill black people. A 2015 study by a University of California at Davis researcher concluded there was “no relationship” between crime rates by race and racial bias in police killings. A report released [pdf] ... by the Center for Policing Equity, which reviewed arrest and use-of-force data from 12 police departments, concluded that black residents were more often targeted for use of police force than white residents, even when adjusting for whether the person was a violent criminal. ... an independent analysis of The Post’s data conducted by a team of criminal-justice researchers concluded that, when factoring in threat level, black Americans who are fatally shot by police are no more likely to be posing an imminent lethal threat to the officers at the moment they are killed than white Americans fatally shot by police. This does not even include arrest rates. As The Root previously reported, New York City police make more arrests in working-class black and brown communities than they do in predominantly white communities, even when officers are responding to similar 911 or 311 calls in each of those communities. 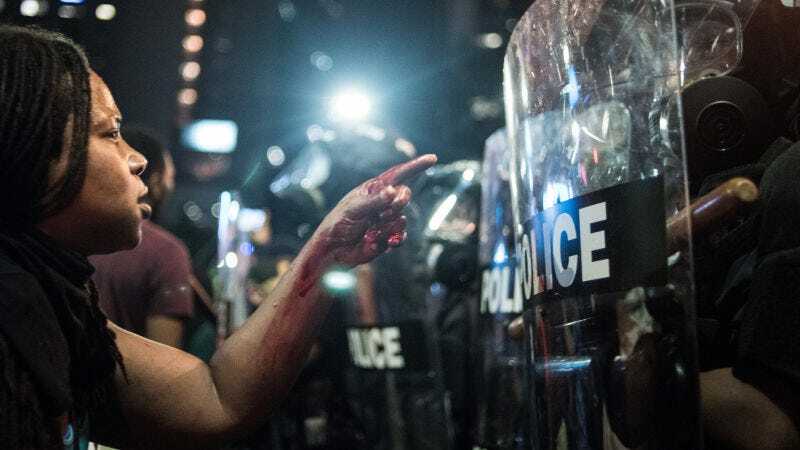 Black communities have been brutally and relentlessly tormented in ways that often seem unfathomable, and to even entertain the idea that police brutality and state violence are race-neutral is abhorrent. It is equally abhorrent to give such blatantly racist analysis breathing room under the guise of objectivity in order to make the point that a movement focused on the desecration of black lives must center white lives in order to be most effective. We live in a nation where a 12-year-old child was gunned down in a police drive-by simply for playing in a park—and the state insisted that he caused his own death. The answer to that is not centering white lives. In a nation built on stolen land, genocide and slavery; in a country that has lynched and incarcerated black, brown and indigenous people with impunity, the audacity of anyone to slyly reprimand black organizers, activists and journalists for not spending enough time begging white people to see their own humanity—in hopes that, in turn, the protection of whiteness will blanket us all—is the most condescending and ill-advised analysis that I have read in quite some time. Black activists are fighting for an end to white supremacy, the material ways in which whiteness poisons every single thing it touches. There is absolutely no redeeming value in a racial and political construct that, by design, empowers and protects one group of people while systemically dehumanizing another. Though we are living in a political zeitgeist where liberals are negotiating with “the white working class” and calling it progress, it is not our job to save white folks from the very institutions they protect and pledge their allegiance to, black lives be damned. It is not our job to create space for “those who put fighting racism low on their priority list; and anti-black racists” hoping that “race-neutral” calls for justice will activate their humanity. We have told white people for a long, long time, that if they come for us in the morning, they will come for them in the night. We have said time and again that more white people will be collateral damage in a murderous, white supremacist system. We have warned over and over again that the house is burning, but white people continue to act shocked and awed when their loved ones are burned, and then blame black people for not abandoning their own children to bring back the hose. What else do they want from us? Black people have put their lives on the line for this movement, and some have died because of it. Black journalists have lost countless hours of sleep reporting from the front lines and being arrested for doing so; some have stayed awake with tears in their eyes and rage in their hearts, amplifying through social media stories that mainstream media deemed unimportant. Black activists are suffering with post-traumatic stress disorder, unable to bear the sound of fireworks because it reminds them of the sound of rubber bullets and tear gas. Black organizers are being surveilled by the state, and some fear they will be the next Fred Hampton. There is no room for trickle-down progressivism in this movement. To suggest that black people are better served by focusing equally on saving white lives as a matter of “strategy”—effectively neutralizing the movement—knowing the cost of protest and the heavy toll of movement work, is to show a blatant disregard for black lives. Daniel Shaver did not deserve to die. The next Daniel Shaver will not deserve to die, either—neither will the next Jeremy Mardis. It is up to white people to decide if their ignited desire for justice is greater than their apathy and, at times, hatred for black lives, because there is a movement already in progress. It is not black people’s job to create a White Lives Matter version of it to appease white sensibilities. It is not our job to hunt for the morality within white people who would otherwise be content watching black people die.